Happy Thanksgiving everyone! We sure had a busy and fun time the last few days. We stayed in Fayetteville and got to visit with lots of the Bramell/Pugsley family. Of course, there was a lot of cooking, eating and card playing going on. Here are some pictures from the festivities. This may be my favorite picture from the whole holiday. It's Becca with her Uncle Bernie, who is Lee's brother from Tennessee. How sweet! This is a picture of Lee's mother and her kids (but not all of them!). Dennis was here earlier in the week, but he had to leave before this picture was made. This is Rob, Lee, Francena, Ben and Bernie. Another sibling there, and they wouldn't have all fit on the couch! And here is a picture of us all (Fergie included, of course). Toby was in Little Rock at the Razorback game, so he missed the picture, too. Last weekend, Becca finally let us put pigtails in her hair!! Yay! Granted, they aren't the best looking pigtails ever, but we got them in. Big victory for mom. Don't let the innocent face fool you! First off, let me say I know what you are thinking. 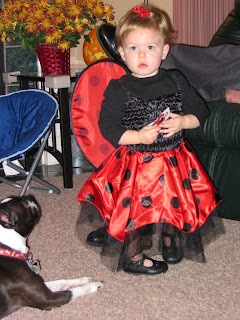 Yes, I know that we have to stop it with the ladybug insanity. 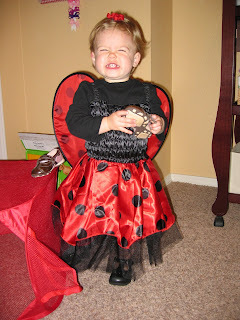 But isn't she the cutest ladybug you ever saw?? 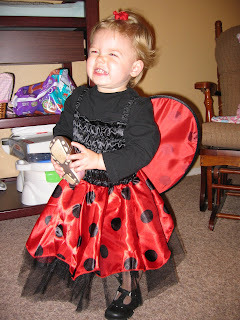 She loved being dressed up; she never fussed or cried about her costume at all. Not like last year, when all she did was cry! We trick-or-treated to about 4 or 5 neighbors' houses, which was a lot of fun. 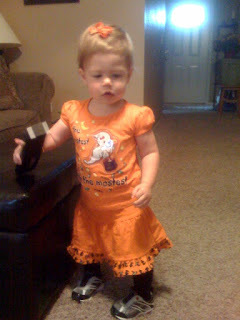 Once Becca figured out that holding out her pumpkin got her something, she had no problems at all. We were happy that Becca's friend Madison and her daddy joined us on our jaunt around the block. Madison lives on the street behind us and she is Becca's first friend! Maddie is about 4 months older than Becca and they love to play together. We came home to hand out our candy at home. I'm sure Becca loved this part more than walking around the neighborhood! She ran to the door each time the bell rang and after awhile, she greeted the kids with a warm "hi!" Before the night was over, she was handing out the candy like a pro--so cute! She didn't want to drop it in the pumpkins, she wanted to put it in the kids' hands. So, without further ado....here she is! They had a Halloween party today at Becca's daycare. Instead of wearing her costume, we dressed her in this cute ensemble that Grandma Francena got her. The little skirt has a ruffle with black cats and witch hats on it. 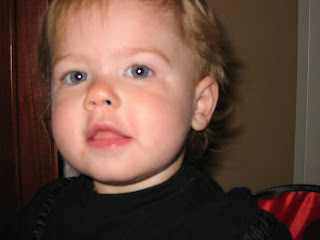 The shirt has a ghost with a strobe light that blinks when she moves. Pretty cute--especially the tennis shoes, I know. I just wish she would be still to take a decent pic. 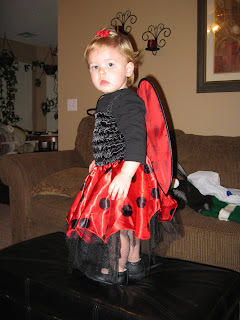 Tomorrow she will be a ladybug (what else?) and we might walk around the neighborhood to be seen. Not sure when this one was taken; it was on Lee's phone. But cute. 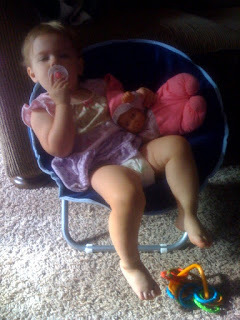 Here is Boo chillin' in her easy chair with the night-night baby. She's got it made, huh. something that sort of sounds like "pumpkin"
And the funniest of all is when we say "Eat your chicken," she says "bok, bok, bok!" Just wanted to share that after 30 long years, my dad has officially retired from UPS! Now we just have to convince him to stay home and take it easy for a while. He deserves it. Congratulations, dad! 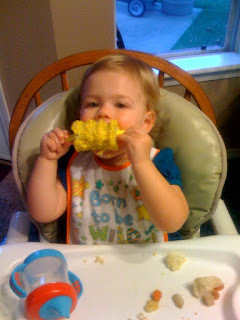 Here are a few pics of Becca. Excuse the red eye in the first one. We didn't notice until after it downloaded. We had a busy weekend in Wynne for Tracy's wedding festivities. I'll have pics to post when she gets them from her photographer. We didn't have time to take any because of all the shopping, cooking, cleaning and chasing the Boo. It was a great party and everything was perfect! Another exciting thing: STAY TUNED! We entered Becca into the Gap Kids model contest. They will pick 20 finalists for a trip to San Fran, CA for a professional photo shoot. The winner gets to model for Gap for a year and a new Gap wardrobe. Wouldn't that be cool!! The middle pic below is one that we entered in the contest. We'll keep you posted. Please keep your fingers crossed!! YAY for Tracy and Jonathan!! Today they got married in Eureka Springs. We are very happy for them and can't wait to celebrate with them next weekend. I talked to Tracy this afternoon and she said the ceremony was beautiful and their romantic cabin is very nice....with only one problem. They don't have cable!!! Ha, ha. I told Jonathan that I bet most people don't go to a romantic cabin in the woods trying to watch football! Here is further proof of our love for dear Ernie. This is the only time Becca will sit still to watch the TV! How cute is this? Here are some pictures of playtime. She's wearing her souvenir shirt from Destin. We couldn't pass this one up for sure! And of course, our other baby. 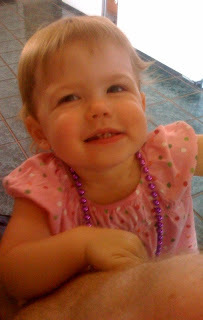 I think she's been left off the blog lately, so here's one of the princess. An update: while we were in Florida, she stayed with my friend Shannon and her dog Nicco. They made fast friends and missed each other so much after our return home that we've had to make playdates for them. Our first playdate was a smashing success, and I know there will be more. So I got to thinking it was about time to do another installment of What Becca Likes for our loyal readers. The last couple of weeks have been really trying for us as she's learning so much and doing so many new things (not all good!). Anyway, on with the show. And, finally, What Becca LOVES: Ernie! Yes, the one who lives on Sesame Street. I told her it's a shame that she had to pick a boy that won't love her back. You know, he already has a boyfriend. There is a show on Sprout called Play With Me Sesame, and the other day when it was on she ran into the kitchen excitedly pointing toward the TV. So I came out of the kitchen to see what it was....it was Ernie playing the "Ernie Says" game. How cute! She will also point to Ernie in her books and on her Sesame Street diapers. Well, 15 months into this motherhood thing, I've had another realization. Everything we do is now about what's best for Becca, not necessarily what we want. Duh. Did it really take me that long to figure this out? No, but I think I've been in denial. My baby sister's wedding shower is exactly 45 minutes from now in Wynne. And I'm sitting at my computer in Fayetteville. Yesterday I was so happy to have gotten out of the office early to hit the road for our trip to Wynne, just me and the Boo. I got home to find her burning up with fever--it was 102.6. So we gave her Tylenol and waited around to check it again. It dropped down some, and she seemed to be her normal self, so I decided it would be fine to hit the road and take our chances. We stopped for a diaper change and gas in Russellville and she was burning up again. I checked her temp and it was up to 103.3!! So, in my haste, I decided to head back home to Fayetteville instead of continuing our trip. A temp that high makes me really nervous and I'd rather be home where her doc is and be able to nurse her at home and not worry about a long, sick drive home on Sunday. Well, now it's almost time for the shower and guess what......yep, she's fine. Go figure. The fever's down and she's playing in the living room while I'm kicking myself for being a wuss. Of course, if we'd gone on to Wynne I'm sure she'd have a 103 temp and I'd be kicking myself for not staying home. Damned if you do, damned if you don't. Right? TP, I'm so sorry to miss your big day. I hope you have a wonderful time and I'll see you next Saturday for our special day together. At the pier in Destin. Cousins Nathan and Sarah. Becca seemed to have a crush on Nathan...we were in Tennessee. Perfect ride for a Boo! !